Shelter Island is a lovely island about 45 minutes outside of New York City. I spent a few summers there as a child and have some strong memories, all involving water, both sea and pond. The pond was a swimming hole favored by children. It had that pond smell and taste and the fresh water was a nice change from the briny ocean. What set it apart from any other pond I have ever swam in, were the big catfish that flashed orange and gold in the murky water. They were very large. I have taken into consideration that I was smaller back then, but I still remember them being larger than my beagle, who used to hang out on the water’s edge, watching me swim. You would think that having large creatures swimming around you would be freaky – sometimes they would touch you – and it kind of was, but they were slow and majestic and sparkled like jewels. Once you knew they were there, and knew they were harmless, even though the mouths are quite broad, it was a most astonishing, memorable experience. But my food related memory had to do with the sea. My father taught me how to swim at a very early age, and I felt as comfortable in an aquatic environment as on land. I was fearless and would spend hours in the ocean, timing the large waves, diving into their foundations before they could crash upon me, rising up on the other side, safe and buoyant. We would snorkel together around the shore’s edge, watching fish go in and out of their rocky homes and swim out way past the breakwater, where there was a calm stillness as we bobbed. My father would tell me how long the navy men had to tread water in order to pass their tests, and I would try to meet or beat their requirements. I lived for this sort of stuff. The spring I as eight years old my father took me to a dive shop to get fitted for a wet suit. I wasn’t sure why I needed one but I didn’t know any other kid with their own wet suit, and it seemed special and odd; I liked both of those things. It was hard to get into and my arms felt like springing out to the sides. I had to work at holding them down; it was like shimmying into a rubber straw. We also got what my Dad called a diving raft. It was an inflatable raft, but not like one I had ever seen before, or ever seen since. It was about 6-feet long and maybe 4-feet wide. It was dark blue canvas on one side and dark green on the other. My Dad said this was so sharks couldn’t see it in the water. I didn’t know if that was true, but it made an impressive story to tell my friends. The short end, where your feet would go, had squared-off corners. The top part however was rounded, and had a hole in the middle. You could gaze down through the hole with your diving mask to see what was happening beneath you, or, you could hang a net and keep sea life in there that you had caught. Apparently we were in for some serious diving. The raft even had a weight system, so that you could dive away from it, and then find it where you left it floating. That summer we loaded all of our gear into the car: raft, masks, snorkels, flippers, net, spear gun, my wet suit and assorted other accouterments. My Dad had a diving knife, which he strapped onto his leg. It looked very James Bond. He didn’t have a wet suit. Apparently he was tougher than I. He drove us out to a beach that I had never been to before, way at the very tip of Ram’s Head, a small island reached by a causeway from Shelter Island. No one else was there and the beach was very pebbly, and hurt beneath my toes. My Dad explained that there was a shelf out there in the water, and that we were going to dive for scallops. He didn’t explain what the shelf was, but the mention of scallops intrigued me. Years before my Dad and Mom had rented a boat for the summer and made friends with the local fisherman, who had rented it to them. He told them where all the hot spots were, and this was one of them. Residents were allowed one bushel a day. As summer renters, we were considered “residents”, or at least that’s what Dad said. We suited up, placed the net in the hole of the float, and started walking into the water. This beach stayed very shallow for many, many feet from shore. I hopped onto the raft, while my Dad walked beside. It started to get a little deeper so he started swimming, while I paddled. All of a sudden, he dove in and disappeared. Not ever being interested in being left behind, I dove in too. I could see him about 15-feet in front of me, so I followed. We were still in a fairly shallow area, so I could see the pale beige sandy floor. All of a sudden, he dove what appeared to be straight down. By the time I caught up to the point where he had disappeared, it was like the earth opened up beneath me and was ready to swallow me whole. This was the shelf he was talking about. All of a sudden, the sea bottom was much farther away and there was a lot of water beneath me. Again I followed him down, but I quickly lost interest in where he was because all of a sudden I realized that there were things zipping around me. I use those words deliberately as at first I didn’t know what the “things” were. They would zip to the right, then slow down, then zip again, sometimes in the same direction, sometimes in another. Whatever they were, I saw that my dad was grabbing them and heading up to the surface. I needed a breath, so I swam up too. We both came up next to the float, which I could see from underneath. How bad is a shark’s eyesight, I wondered? My dad was putting things in the net. “Scallops!” he declared. He held one out to me and I realized that this is what I had seen, which at first boggled my mind. Didn’t scallops just sit there, lounging in the sand? At least that was the image I had. I took one in my hand and it looked like the shells you find on the beach, but this was two of them, and they felt like they were glued together. I let it go and immediately put my masked face in the water to see. It was slowly falling downward, when all of a sudden it made a movement! It started zipping around in what for it, was a directed fashion. I popped back out of the water, with what must have been an incredulous look on my face. I remember having a wide smile and feeling that I would smile even wider, except the suction from my mask made that impossible. That’s all I needed to hear. I was going down again. So we dove down and this time I was prepared to take in what I was seeing. Dozens of scallops were scooting around, while others did seem to lounge about, taking rests in between what looked like large bursts of energy. You could also see their little twinkling eyes, which were spaced evenly along the curve of the shell and were exposed when the shells relaxed and opened. 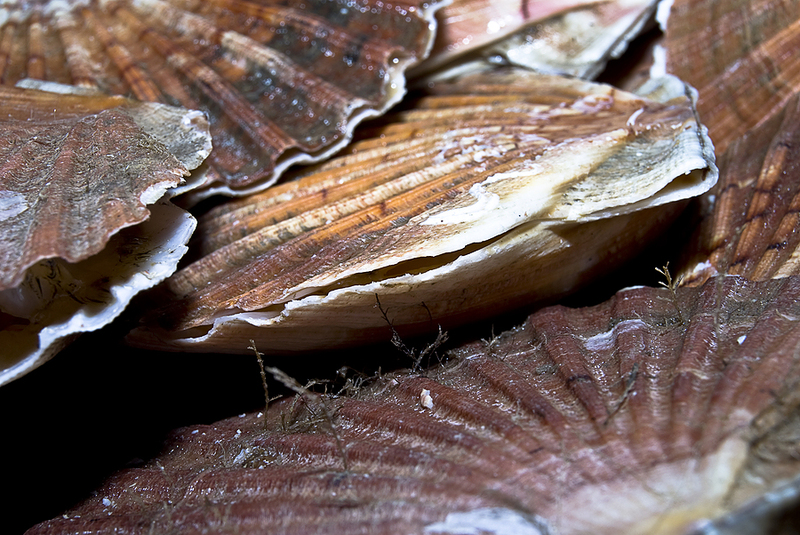 We harvested dozens of scallops that day and enjoyed some raw, right on the beach. Come to think of it, that was my first sashimi, and my Dad’s knife didn’t seem so superfluous at that point. Others were later fried or simply steamed until open in a shallow kettle and we enjoyed them plain, with a squirt of lemon. On another side of the island we used to fish for whiting, right off the beach. There was a very narrow inlet that was subjected to extremely strong ocean currents. It would be scary to a child that wasn’t prepared, but I thought it was as fun as an amusement park ride! I would walk into the path of the current and as soon as I lifted my feet, it would swiftly carry me about 30 feet down the sand. It was strong enough to whisk me away, but I could always put my feet down into the sand, stand up and walk away. My Dad would bring a fine meshed net and he would walk through the strong current to the other side. Then, with me opposite him, we would lower the open net, straight down, creating a webbed wall. The tiny fish, each one no more than 3-inches long and silvery, would swim right into the net by the dozens, carried right into our net by the current. All we had to do was fold the net up and collect our catch. It was easy to come up with a gallon’s worth of fresh, wriggling fish in short order. My Mom would fry them whole and we would eat them as snack food, before dinner. They tasted like slightly fishy potato chips and I couldn’t get enough. Occasionally I would think about the fact that I was eating a whole fish, which included the eyeballs, and all the guts, but then I would just concentrate on the fact that they were crunchy, and greasy in a wonderful way, and lightly salted, and addictively delicious. As I write these stories, I wonder if these places still exist, and if they do, if the sea life is the same. What would happen if I swam out over that shelf and gazed down into that abyss? Would there still be scallops to gather? Am I too heavy for the current to carry me aloft? Somehow, I don’t think life will ever feel that buoyant again.